Remember my Argos catalogue monitor risers? I now realise that Argos catalogues aren’t necessary the best products for everyone’s monitor rising needs. How about a website that allows you to specify how high you want your monitor to be raised and it tells you which catalogues to use, e.g. I didn’t check the measurements for that example. It was just an example. 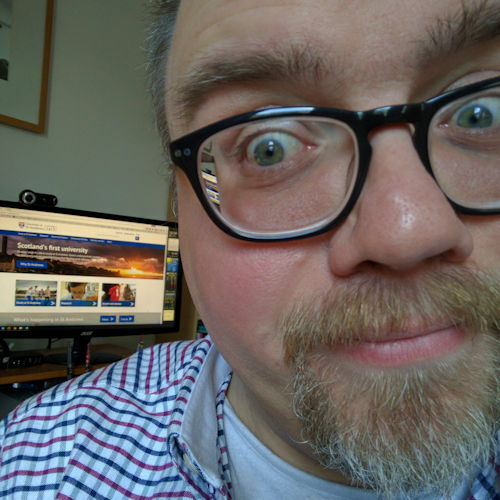 I just need to find someone to build the site now. I wonder if Google would be interested. 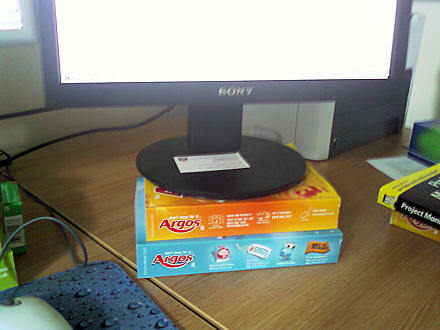 Readers may be interested to learn that the Autumn/Winter 2007 edition of the patented Argos monitor riser is now available from your local branch of Argos. The latest version is in a tasteful blue. 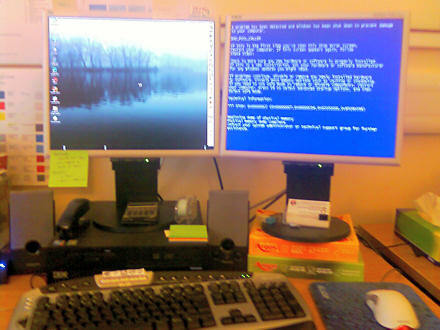 In other news: I’m now down to only two monitors now. I look like such a noob! My own second monitor has a bug in it. Literally a real live bug / beastie … well, it’s dead now. I’ve taken it over to helpdesk to see if it could be carefully removed. It’s sitting between the glass and the actual LCD screen. The kind techies said that they’d give it a look. One bonus of having two monitors at work is that if you suddenly get a Windows XP Blue Screen of Death (BSOD) — my first in maybe five years — then at least you can see your pretty Windows desktop image and the BSOD! You can also see from that photo that I got myself a Microsoft Digital Media Pro keyboard for work too — it just feels so good to type on, and I love the extra buttons — they make me so productive. And I’m still using my mouse of choice: the Microsoft Intellimouse Optical — I love its five buttons (from left to right: back, left-click, double-click (wheel), right-click, forward).